Often unseen Gardeners friends, but they're always there...somewhere! You see I have had to use someone else's photo's for the Snakes. This is simply the fact that when you look for them, you never find them and they have a habit of suddenly jumping out from under a piece of wood when you're least expecting !! The UK's only venomous Snake is quite common in grassy areas such as that bit you haven't cut for a while or the pile of grass cuttings. Upon approaching them they will seldom move. It's only if suddenly disturbed they may run (or slither) away rapidly. They will only bite in extreme defensive situation. I was bitten by one on a Scout Camp many years ago, quite painful at first - went to Hospital, don't know what they did but they had the scalpel out! No harm done. They are quite small in size, the male only growing to about 60cms long. To spot one, or any snake, leave a sheet of corrugated iron or some old wood down on fairly short grass and on a sunny day look underneath. 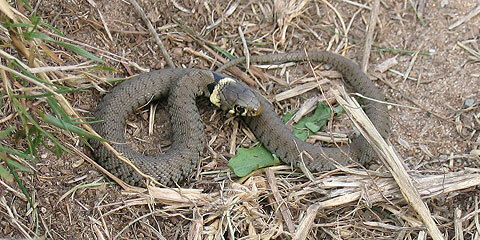 The Grass Snake can be found almost anywhere in the Garden but likes a good lawn cutting pile or compost heap. I once picked up some cuttings and to my surprise one jumped out straight onto my neck, fell to the ground and away! As I said, they are there when you least expect them! A wonderful sight is to see them crossing a Stream or Pond, they also like water and being near it. Grass Snakes hibernate through winter, usually in rotting vegetation, so a Compost Heap is ideal breeding and hibernating ground. They are not found in Scotland, Northern Ireland, Scilly Isles or the Channel Islands. I love these little creatures, the photograph was me picking one out of a large tub, he refused to budge but gladly climbed on to my hand. I find them under bits of Wood I have in the Vegetable Patch, they live in a slight bank with long grass and nettles growing on it. They can be found almost anywhere; grassland, woodland, usually where they have quick access to the open for basking in the sun. 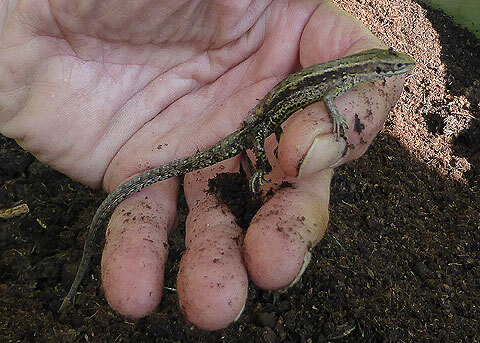 Contrary to some belief, the Slow Worm is actually a Lizard and not a Snake or 'large worm'. As all the others though, they enjoy a good compost heap to live in and will slowly prowl around for any invertibrates. I've seen one in my Chicken Run, but when I did, it was too late, they have many Predators including Cats.